Tax Centers of America (TCOA) is a franchise-based corporation specializing in income tax preparation, online and electronic tax filing for taxpayers who want their refund fast! It is the same service offered by other companies such as H & R Block, Jackson-Hewitt, and others. Tax Centers of America is the only tax franchiser that is willing to offer a " Buy 1 Get 3 Free" to any new franchisee. That's right! Buy 1 Get 3 Free. You get four tax franchises for the price of one. This is your chance to join the BEST franchise in America. EZ Tax is a simple, easy to use tax software that can be sold to existing businesses for cross selling. You make a profit by selling the tax program and residual income off of each tax return. The #1 Reason to Choose Tax Centers of America? Tax Centers of America (TCOA) is a tax franchise-based corporation specializing in income tax preparation, online and electronic tax filing for taxpayers who want their refund fast! It is the same service offered by other companies such as H & R Block, Jackson-Hewitt, and others. The Best Value in a Tax Franchise Return System? You Decide. 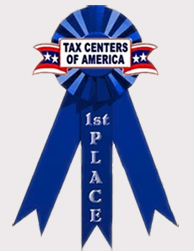 Tax Centers of America recently received a first place ranking for franchisers in the Income Tax Category. The Best Value in a Tax Return Franchise System? You Decide. Work with a Tax Centers Of America Tax Specialist. We will work for you to settle your case with the IRS for much less than you originally owed. To solve your IRS problems call 1-954-489-2556.